Today's Sketchnoter is Mary Ottenwess and here is her story. 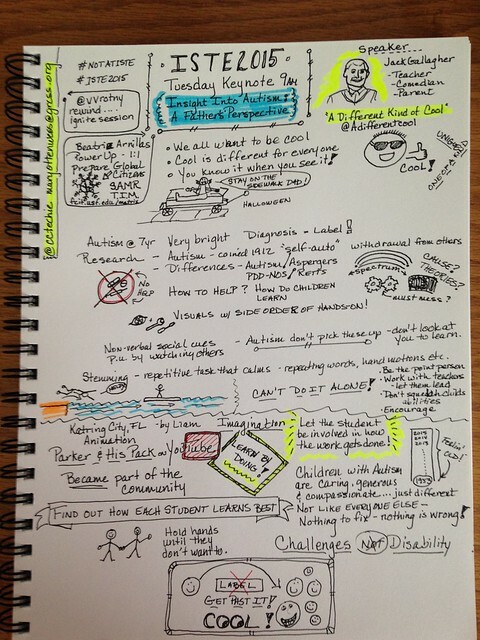 I was first introduced to Sketchnoting at the 2015 MACUL (Michigan Association for Computer Users in Learning) conference. I had seen sketchnotes before and they intrigued me but I had no idea how to get started. In that one hour session with Karen Bosch, I found a wonderful means of recording ideas, thoughts, quotes and inspirations in a format that I actually enjoyed reviewing and updating. My handwritten notes were always full of doodles in the margin and now I had a means to connect those doodles to the content. I’ve attended many conferences, meetings and webinars since then and I am usually sketchnoting. An artist I’m not but that’s the best part! You don’t have to be! With a few arrows, bullet points, lines and circles you can add some graphical elements that assist with retention of the material. With practice, and a great resource in the The Sketchnote Handbook, you too can be a sketchnoter! I did a little research to discover why sketchnoting is a good thing for education. Dual coding theory, developed by Paivio (1971), explains that the brain uses two separate but interacting systems of storage for memory: what we hear and what we see. Looking at a visual representation of a concept presented during a lecture prompts the brain to recall the verbal portion. 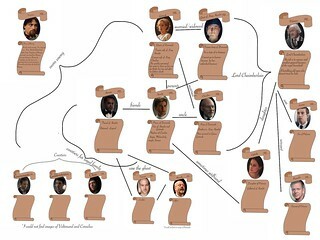 Two paths to a memory are better than one! I also watched Brandy Agerbeck’s Tedx Talk, Shape Your Thinking in which she pointed out that there are two types of thinkers, Auditory/Sequential who think in words and Visual/Spatial who think in pictures. 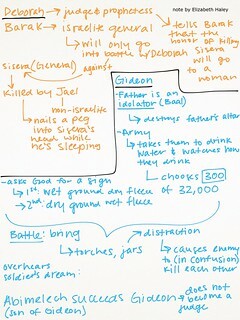 Standard classroom note taking favors the auditory/sequential thinkers who make up only about 37% of the population. Sketchnoting would benefit the other 63% of learners who are more visual in their thinking. That sounded like something our teachers needed to know about. 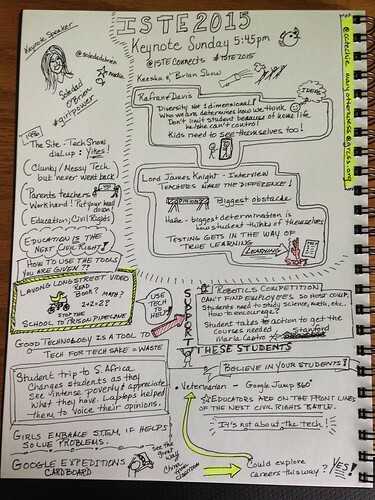 At our next PD session I introduced sketchnotes and the theory behind it. Our art teacher and the doodlers in the audience were intrigued. Next we demonstrated the concept to some of the students. Since we are a 1:1 iPad school our demo included various apps and styli that could be used with their iPads and they were able to choose what worked best for their notes. Elizabeth Haley and Ana Mugica-Canos are both student sketchnoters using their iPads throughout their school day. Elizabeth likes sketchnoting because she can group topics by color and uses lines, arrows and brackets to link the concepts and highlight important ideas and has found sketchnoting to be a useful tool to make her notes a better study resource. Ana utilizes elements of sketchnoting for both her artwork and classroom notes. When asked why she enjoyed using the iPad and draw apps in this way she stated, “You can import pictures, so you can take pictures of assignments and notes and using the app, you can write directly on the notes or assignment in your own handwriting. 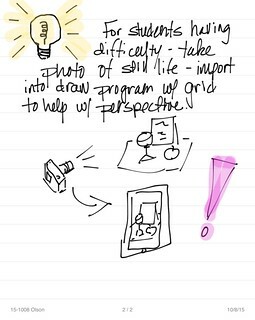 You won't waste paper or supplies doing drafts, you can just edit away on one screen that has multiple layers that can all be edited.” Examples of student sketchnotes are included in my sketchnote Flickr album. Sketchnotes are also great for classroom observations. 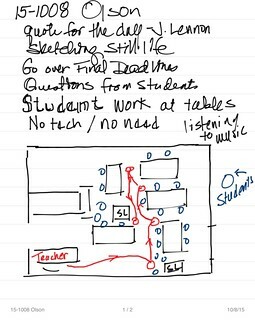 I can draw the layout of the classroom, show teacher movement, idea connections and graphically illustrate student engagement with the content. This can be useful when redesigning the layout of the classroom for better movement and workflow. It’s been just a few short months since introducing sketchnoting to our staff and students but we have found the practice to be very beneficial!